Ann Spradling, et al. 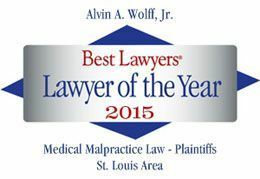 v. SSM Health Care St. Louis, SC90613, has challenged the Missouri medical malpractice provision that requires a plaintiff to a file written opinion from a doctor “practicing substantially the same specialty” as the defendant doctor. This means until a doctor has reviewed all the records and signed an affidavit saying there was negligence, you cannot file a lawsuit because it will be dismissed. Doctors are the only class of defendants who get this special treatment. This requirement sets the bar for getting into court higher than what is needed as evidence in a case to get to a jury. However, the requirement that the expert is from the same specialty puts an extra burden, as many doctors are qualified to give opinions even though they are not denoted as a specialist in a certain area.For the same reason, a nurse, even though he or she can't testify as to causation in court, would have to state causation in the affidavit. It makes no sencse. The Plaintiff in the Spradling case is claiming that the higher standard to maintain Missouri medical malpractice lawsuit interferes with her access to the courts. The second case, Edith C. Deck v. Delmar Teasley, SC90628, deals with an issue regarding the amount of medical bills admissible as damages at trial; the amount billed by health care providers or the reduced amount an insurer pays to satisfy the bill. Again, this is a constitutional argument of a right to a trial by jury. The Eastern District has already settled the matter in allowing the amount billed to go before the jury, the Western District of Missouri has held otherwise. Hence, the Missouri Supreme Court will probably resolve this issue once and for all.